These premises had the honour of being in the same family for the longest time in the 20th century. However, for the first few years it was the business of carpenter and broker, R.C. Collett. By 1906 the printing business of Mr J.W. Cox occupied the premises. Mr Cox had previously been in business further up the road at Westall Buildings and in the 1904 street directory was described as a Practical Relief Stamper and Copper Plate Printer. By 1910 the once familiar name of Leat had taken over the premises. Cameron Earl Leat was born in about 1885 and served an apprenticeship as a newsagent and stationer with a Gloucester company. He came to Cheltenham as a young man and started his career with the newsagents Cussens and Knight, in the High Street. Cameron married his wife Florence in Cheltenham in 1908 and they had three children, Stephanie, Douglas and Jack. For a while the family lived over the shop in Bath Road. Jack sadly died in 1937. During the Second World War Douglas served in the forces and on his return he took over the business. Cameron and Florence moved to a house Old Bath Road and it was here that he died in December 1943 at the age of 58. At the time of his death it was reported that he was the probably the oldest agent for the Cheltenham Chronicle and Gloucestershire Graphic newspaper. After Cameron’s death, and whilst Douglas was in the forces, Florence carried on the business. She was assisted by her friend Dorothy Batstone, whose family had been local confectioners. Like many things in wartime, stationery was difficult to obtain and stationers were allocated only a limited amount to sell. On his return from the war Douglas found there was very little stock and a great deal of work went into re-building the business. He carried on working at the shop until shortly before his death in 1998. The newsagents then passed to Douglas’s son Jim, who was later assisted by his own son Steve. 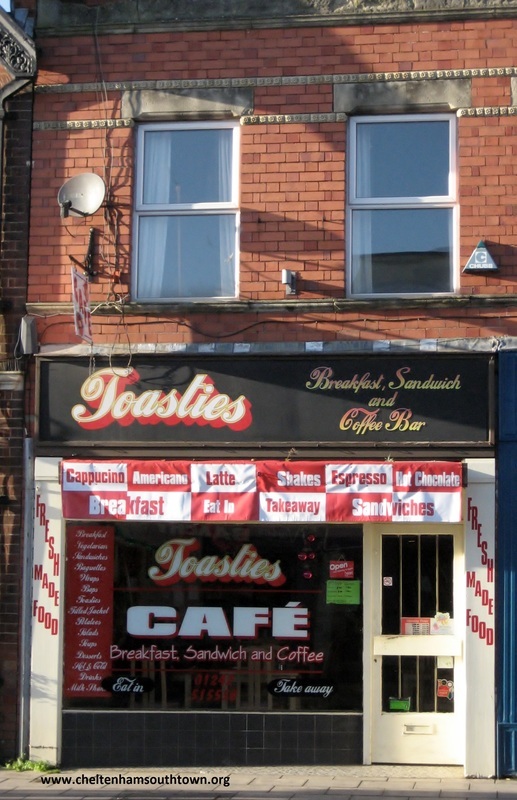 These premises are now occupied by Toasties cafe.